Four decades ago, measures were taken to slash the phosphorous levels in one of the Laurentian great lakes – Lake Erie. But now the blue-green algal growth in the water surface of the Lake is back. Satellite imageries and other studies proved that the reappearance of phosphorous in the watershed is the principal factor behind the reappearance of the algal growth. 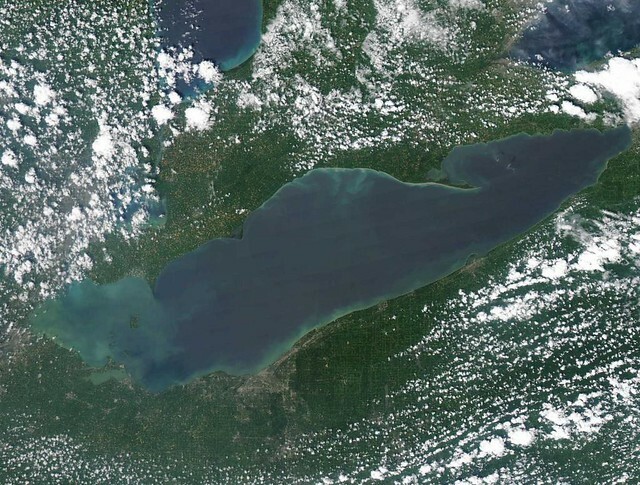 Four decades ago, Lake Erie was found to be contaminated with phosphorous materials. At the time, the waste water treatment plants serving the large cities like Cleveland, Detroit were responsible for the discharge of phosphorous substances in the water. Several measures taken to cut the phosphorous pollution in the watershed proved to be successful as the amount of phosphorous decreased in the following decades, and the blue-green algae disappeared from the Lake. This time round, the main culprit behind phosphorous pollution is the agricultural fields and the local gardens, nurseries etc. These agricultural fields, nurseries, and gardens use phosphorus containing fertilizers and insecticides. These chemicals contaminate the soil and get washed off during rain and storms and get deposited in Lake Erie. The storms wash away the surface of the soil and deposit the contaminants in the water of the watersheds. The growth of blue-green algae is in a direct relationship with the amount of phosphorous in the watershed. Phosphorous substances are invaluable for the growth of algal cells and the synthesis of their photosynthetic pigments. Thus, the growth is enhanced. As a result, the total amount of dissolved oxygen (DO) is reduced in the watershed. This proves to be fatal for the watershed ecosystem as the appearance of dead zone is observed in some areas of the Lake. The dead zone is increasing with the growth of blue-green algae as it does not permit the aquatic ecosystem to sustain its existence without dissolved oxygen. The blue-green algae cannot be removed even by boiling the water. Thus, it is a real threat for the Lake; not only for the ecosystem, but the ingestion of blue-green algae injurious for the human being also. Studies have revealed that phosphorous contamination is lower in the portions near the river, whereas the contamination is high in the areas where the flow of water is less. This problem needs immediate research to develop novel techniques for the removal of phosphorous contaminants in the water.